Home Miscellaneous Media Interview Exclusive Interview with Smt. 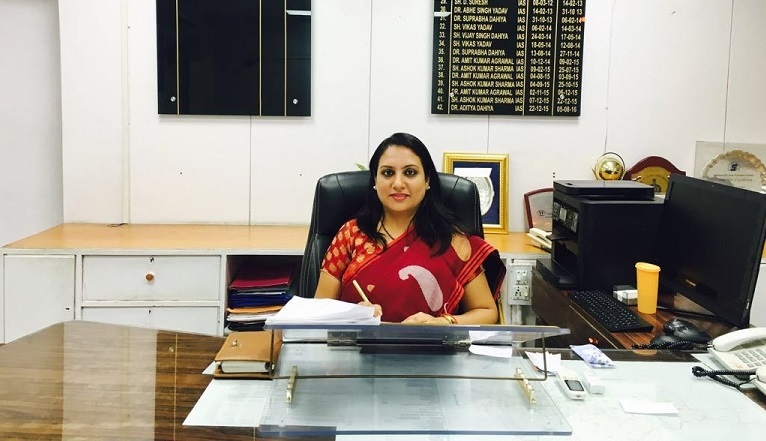 Sonal Goel, CEO Faridabad Smart City Ltd.
Apart from being the largest city and largest corporation in Haryana, Faridabad also contributes to the development of economy in the entire National Capital Region (NCR), says Sonal Goel, Commissioner, Faridabad Municipal Corporation and CEO, Faridabad Smart City Limited. What initiatives are being adopted by Faridabad Municipal Corporation for the Smart City project? Faridabad has been selected in the second round of the Smart Cities Mission. We have engaged a Project Management Consultant (PMC) through an international competitive bidding to design, develop and implement smart city projects. Based on the Area Based Development (ABD) and pan-city components, Faridabad was able to get into the Smart Cities’ list. The Union Ministry of Urban Development has sanctioned a total outlay of Rs 2,600 crore that includes Rs 2,100 crore for ABD and Rs 470 crore for pan- city development mission. Under ABD, urbnaisation, redevelopment and rejuvenation have been the major focus areas whereas in the pan-city components, it is mainly IT-based solutions and Solid Waste Management. With the vision of transforming Faridabad to a cleaner and greener city by introducing smarter ways of living, Faridabad Smart City Limited (FSCL) has started several measures to implement the projects as identified in the Smart Cities challenge proposal. Here, I express my thanks for the support and guidance of our visionary leader and Hon’ble Chief Minister of Haryana Shri Manohar Lal Khattar. I also thank Union Ministry of Urban Development and State Government of Haryana for extending their support. So what is your next plan of action? Faridabad has initiated several measures to implement smart city proposal in a planned and phased- manner. A blueprint for implementation of various projects has been prepared. FSCL envisages investing Rs 648 crore by 2017-18 in almost 10 sub-programmes. Some of the major development projects that will be implemented include smart road, smart e-toilet, open air gym, rainwater harvesting, generating 15 KW power from solar energy, integrated command and control centre etc.We have also adopted some long term measures that include rejuvenation of Badkhal Lake and Lakefront Development, Barhai Talab etc. We have also planned several initiatives using IT solutions. At pan-city level, it is proposed to develop smart traffic and transit management system with an effective IT system, using latest technology such as SCADA system for leak management of water supply, automated online water quality monitoring system, provision of smart toilets and smart solid waste management, wi-fi, underground cabling, solar rooftops and LED street lighting etc. What distinguishes Faridabad from other cities across India? Faridabad is the largest city and largest corporation in Haryana. Known for its industry, it also contributes to the development of economy in the entire NCR region. If we talk about connectivity, construction of Badarpur flyover, and extension of Delhi Metro up to Ballavgar is significant. With this, a synergy has been evolved for industrial development. Metro connectivity from Mujasser to Central Secretariat has also given a facelift to the city. I believe, Faridabad is a potential city which was first selected as a Smart City by the Government of Haryana. Our proposals like creating a multi-model hub and linking different modes of transportation including railways, metro rail and highways will make Faridabad very different and special from other cities. How do you perceive Digital India and cashless economy? After the Government of India and Government of Haryana mandate, the Faridabad Municipal Corporation is also trying to implement many initiatives. We have started online payment of taxes, setting up of ward level offices. We have made available a toll-free number. There is an emphasis for a proper citizen grievance redressal system. We have already signed a Memorandum of Understanding with the National Institute of Urban Affairs for setting up innovation Hub for ‘Urban WASH’ solutions in Faridabad. We are also starting a mobile application that integrates all the city services, providing more availability to citizens. What initiatives have you undertaken for Swachch Bharat Mission? With the help of Janagrah (an NGO) we have created a Swachchta app. Being the largest city in Haryana, more than 700 metric of garbage is generated everyday in Faridabad. At present, the city is lacking an integrated solid waste management system, though we have a partly functional site at Bhandwari, where garbage of the city is being transported. We also carry door-to-door garbage collection. Recently, the Government of Haryana floated a tender to MoU for integrated Solid Waste Management system. In the recently held Swachchta Survekshan 2017, initiated by the Government of India, Faridabad has been selected as the fastest moving city at the national level in terms of ranking in the Swachchta survey. Through the guidance and support of our visionary chief minister, contributions made by citizens, political leaders of the city as well as the State government, we were able to achieve this. What challenges do you face while implementing Smart City projects? Faridabad has a major challenge to revive the Badkhal lake. In Faridabad, a city with more than 15 lakh population, we have a major issue of encroachment. The most significant challenge, I think, not only for Faridabad but for all cities across India, is of funding. Arranging Rs 1,600 crore for implementation of projects on PPP basis and land monetisation is a major challenge for us. Our Corporation is not a surplus organization. But of course we are trying to overcome these challenges. How FSCL involving companies to build smart solution for Faridabad city ?